American sterling silver napkin ring by Gorham Silversmiths, c.1890. This handsome napkin ring measures 2" in diameter, 1 1/2" tall and weighs 39 grams. The soft, warm, original finish is present, with no buffing or machine polishing. The excellent original condition and clear, crisp detail, no monograms or removals, repairs or alterations, make this an especially attractive offering. French sterling silver floral engine turned napkin ring, c.1910. 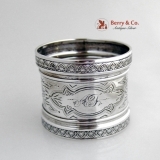 This handsome napkin ring measures 1 7/8" in diameter, 1 5/8" tall and weighs 42 grams. The soft, warm, original finish is present, with no buffing or machine polishing. The excellent original condition and clear, crisp detail, monogrammed Mercedes P. de Garbini 3-9-910, no removals, repairs or alterations, make this an especially attractive offering. American coin silver napkin ring, c.1890. 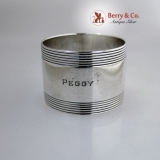 This handsome napkin ring measures 2" in diameter, 1 5/8" tall and weighs 46 grams. The soft, warm, original finish is present, with no buffing or machine polishing. The excellent original condition and clear, crisp detail, monogrammed SAM, no removals, repairs or alterations, make this an especially attractive offering. 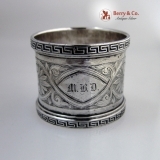 American sterling silver napkin ring, c.1909. This beautiful napkin ring measures 1 3/4" in diameter, 1 1/2" tall and weighs 36 grams. The soft, warm, original finish is present, with no buffing or machine polishing. The excellent original condition and clear, crisp detail, monogrammed Silver Anniversary 1909, no removals, repairs or alterations, make this an especially attractive offering. American coin silver napkin ring by Shiebler, c.1880. 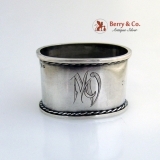 This handsome napkin ring measures 1 5/8" in diameter, 1 5/8" tall and weighs 37 grams. The soft, warm, original finish is present, with no buffing or machine polishing. The excellent original condition and clear, crisp detail, monogrammed LAW, no removals, repairs or alterations, make this an especially attractive offering. Norwegian 830 Standard baby napkin ring, c.1963. This darling napkin ring measures 2" long, 1 1/4" wide, 7/8" tall and weighs 16 grams. The soft, warm, original finish is present, with no buffing or machine polishing. The excellent original condition and clear, crisp detail, monogrammed Davey 24.12.1963, no removals, repairs or alterations, make this an especially attractive offering. 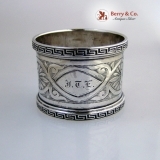 American coin silver napkin ring with a bellied engine turned and embossed paneled body having open work, applied twisted rope borders, c.1860. The shaped cartouche contains a period script presentation monogram: LW to MV. 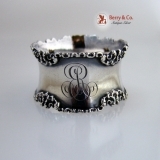 This beautiful napkin ring measures 1 3/4" in diameter, 1 1/4" tall and weighs 20 grams. Monogrammed as described above, the soft, warm, original finish is present, with no buffing or machine polishing. The excellent original condition and clear, crisp detail, with no removals, repairs or alterations, make this an especially attractive offering. American coin silver napkin ring, c.1860. 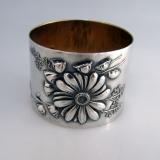 This beautiful napkin ring measures 1 3/4" in diameter, 1 7/8" tall and weighs 27 grams. The soft, warm, original finish is present, with no buffing or machine polishing. The excellent original condition and clear, crisp detail, monogrammed VPB, no removals, repairs or alterations, make this an especially attractive offering. American sterling silver napkin ring by Gorham Silversmiths, c.1900. This beautiful napkin ring measures 1 3/4" in diameter, 1 1/4" tall and weighs 26 grams. The soft, warm, original finish is present, with no buffing or machine polishing. The excellent original condition and clear, crisp detail, monogrammed Mary, no removals, repairs or alterations, make this an especially attractive offering. American coin silver napkin ring, c.1880. 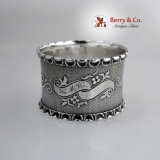 This beautiful napkin ring measures 1 3/4" in diameter, 1 1/2" tall and weighs 22 grams. The soft, warm, original finish is present, with no buffing or machine polishing. The excellent original condition and clear, crisp detail, monogrammed Dewey, no removals, repairs or alterations, make this an especially attractive offering. American sterling silver napkin ring in the Pond Lily pattern by Gorham Silversmiths, c.1900. This beautiful napkin ring measures 1 3/4" in diameter, 1 1/2" tall and weighs 38 grams. The soft, warm, original finish is present, with no buffing or machine polishing. The excellent original condition and clear, crisp detail, monogrammed Florence, no removals, repairs or alterations, make this an especially attractive offering. American coin silver Greek Key boarder napkin ring,c.1870. 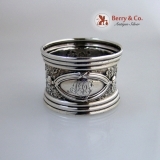 This handsome napkin ring measures 1 7/8" in diameter, 1 5/8" tall and weighs 48 grams. The soft, warm, original finish is present, with no buffing or machine polishing. The excellent original condition and clear, crisp detail, monogrammed MBD, no removals, repairs or alterations, make this an especially attractive offering. American coin silver Greek Key boarder napkin ring,c.1870. 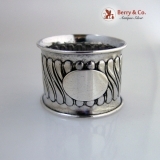 This handsome napkin ring measures 1 7/8" in diameter, 1 5/8" tall and weighs 48 grams. The soft, warm, original finish is present, with no buffing or machine polishing. The excellent original condition and clear, crisp detail, monogrammed JTE, no removals, repairs or alterations, make this an especially attractive offering. American coin silver napkin ring, c.1860. 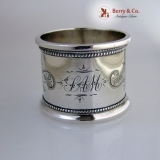 This beautiful napkin ring measures 1 3/4" in diameter, 1 1/4" tall and weighs 25 grams. The soft, warm, original finish is present, with no buffing or machine polishing. The excellent original condition and clear, crisp detail, monogrammed HMH, no removals, repairs or alterations, make this an especially attractive offering. Tiffany & Co sterling silver napkin ring, c.1960. This handsome napkin ring measures 1 3/4" in diameter, 1 1/4" tall and weighs 54 grams. The soft, warm, original finish is present, with no buffing or machine polishing. The excellent original condition and clear, crisp detail, monogrammed Peggy, no removals, repairs or alterations, make this an especially attractive offering. 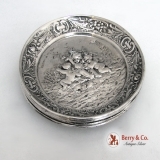 German 800 silver large, round Cherub Repousse butter pats 4, c.1890 - 1910. Each of these nicely detailed, ornate dishes is 3 1/2" in diameter and the 4 weigh a total of 178 grams or 5.7 ozs. Troy. Each is also inscribed, in period script. on the back of the dish: Alexander King. Inscribed as described above, the soft, warm, original finish is present, with no buffing or machine polishing. The excellent original condition and clear detail, with no removals, repairs or alterations, make this an especially attractive offering. German 800 silver Ivy napkin ring, c.1900. 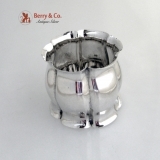 This beautiful napkin ring measures 1 7/8" in diameter, 1 3/8" tall and weighs 34 grams. The soft, warm, original finish is present, with no buffing or machine polishing. The excellent original condition and clear, crisp detail, monogrammed HVML, no removals, repairs or alterations, make this an especially attractive offering. Estonian 875 Standard silver napkin ring, c.1920. This darling oval napkin ring measures 1 3/4" long, 1 1/8" wide, 1 1/8" tall and weighs 15 grams. The soft, warm, original finish is present, with no buffing or machine polishing. The excellent original condition and clear, crisp detail, monogrammed MV, no removals, repairs or alterations, make this an especially attractive offering. American coin silver napkin ring, c.1870. 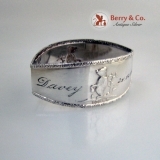 This handsome napkin ring measures 1 7/8" in diameter, 1 3/4" tall and weighs 31 grams or 1 ozs Troy. The soft, warm, original finish is present, with no buffing or machine polishing. The excellent original condition and clear, crisp detail, monogrammed AT, no removals, repairs or alterations, make this an especially attractive offering. 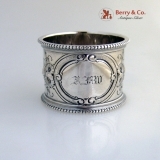 American sterling silver napkin ring by Reed & Barton, c.1920. This elegant napkin ring measures 2" in diameter, 1 3/4" tall and weighs 31 grams. The soft, warm, original finish is present, with no buffing or machine polishing. The excellent original condition and clear, crisp detail, with no monograms, removals, repairs or alterations, make this an especially attractive offering. 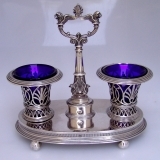 Arabic ornamental carved solid silver napkin ring, c.1900. 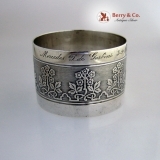 This beautiful napkin ring measures 1 3/4" in diameter, 1 3/8" tall and weighs 42 grams. The soft, warm, original finish is present, with no buffing or machine polishing. The excellent original condition and clear, crisp detail, with no monograms, removals, repairs or alterations, make this an especially attractive offering. 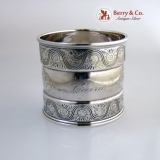 American sterling silver napkin ring by Gorham Silversmiths, date marked for 1880. This darling ring measures 1 7/8" in diameter, 1" tall and weighs 30 grams. The soft, warm, original finish is present, with no buffing or machine polishing. The excellent original condition and clear, crisp detail, monogrammed ER, no removals, repairs or alterations, make this an especially attractive offering. 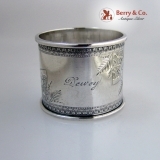 American sterling silver napkin ring by Gorham Silversmiths, date marked for 1882. This beautiful antique napkin ring measures 1 3/4" tall, 1 3/4" in diameter and weighs 36 grams. The soft, warm, original finish is present, with no buffing or machine polishing. The excellent original condition and clear, crisp detail, inscribed Carrie, no removals, repairs or alterations, make this an especially attractive offering. Japanese mixed metals napkin ring, c.1880. 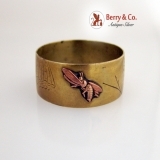 This beautiful napkin ring has two applied copper bugs on an engraved brass body, it measures 1 7/8" in diameter, 3/4" tall. German 800 silver floral repousse napkin ring, c.1890. 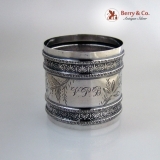 This beautiful napkin ring measures 1 7/8" in diameter, 1 1/2" tall and weighs 42 grams. Monogrammed WS 1904. The excellent original condition and clear detail, with no removals, repairs or alterations, make this an especially attractive offering. 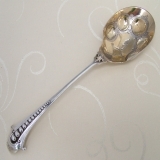 American sterling silver serving spoon in a very unusual graduated ball design, c.1870. The handle has 15 applied, inset graduated balls and a formed handle end with scroll spurs. The shaped, gilt engraved bowl an applied leaf on the shank. This special spoon is 10 1/4" long and weighs 77 grams or 2.5 ozs. Troy. The soft, warm, original finish is present, with no buffing or machine polishing. The excellent original condition and clear, crisp detail, with no monograms, removals, repairs or alterations, make this an especially attractive offering.